An extremely versatile suit, the blue colored groom’s suit goes with almost everything and comes in many different tones. Lighter colors are perfect for spring/summer weddings and they are definitely our best sellers. 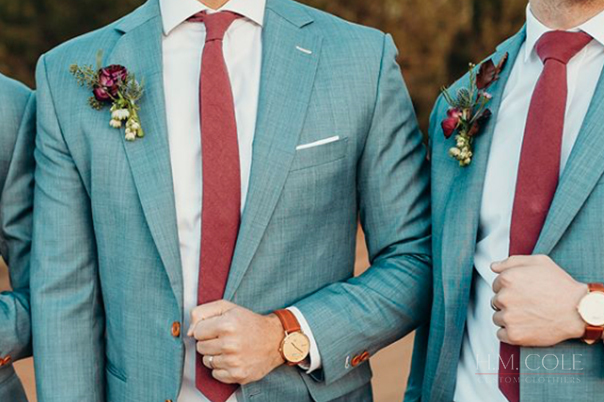 Matched with custom tailoring and unique customizations, this suit is bound to make any groom or groomsman shine. 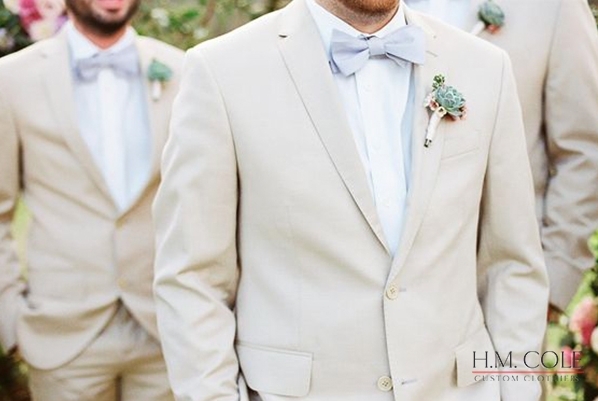 Khaki suits are an extremely popular choice for beach weddings because of the lightness of the fabric paired with fun, bright, summer colors. Charcoal or Gray suits go with almost every color. They’re perfect for matching, especially if you can’t quite yet decide on the perfect wedding colors. Looking suave has never easier than with a tailored charcoal suit. Not only will this suit look great at your wedding but, like blue suits, can be worn after the wedding for less formal occasions. For something more bold try this emerald green wedding suit. Guaranteed to draw attention while still looking dapper. We can’t tell you how many people have come in searching for this suit. While commonly paired with a navy accent color, it also goes well with cream or just matching maroon. The groom who wears this suit is sure to dazzle all who are in attendance.